I blogged about Jen and Myperennial back in March, but after spotting Jen's new initial pillows over at Rare Device yesterday, I knew I had to write about myperennial again. Available in 6 color combinations, these cutie pillows have swirly blooms trapped inside your very own initial - too cute to pass up! 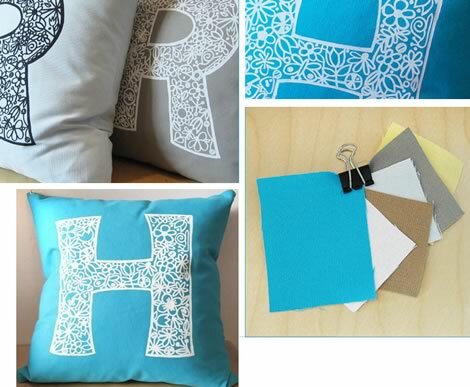 Jen has hand-drawn all her ABC's and silkscreened each one onto a washable cotton canvas pillow cover (with zipper) over a down 16" square cushion. Perfect gift for you, but extra sweet for a new bride or mommy-to-be, too!